Last year’s best selling flagship phone is now on sale via Sun Postpaid. 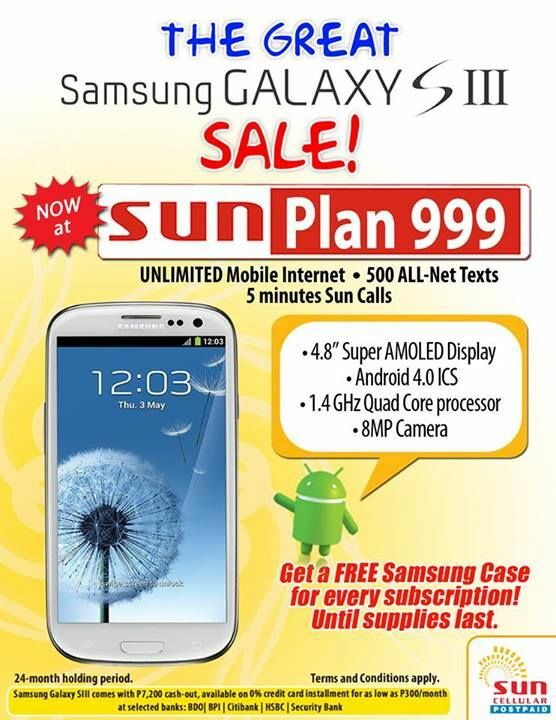 By availing of Sun Plan 999 + P300 monthly amortization for 24 months, you get to take home the Samsung Galaxy SIII. Sun Plan 999 gives you unlimited mobile internet, 500 ALL-Net texts and 5 minutes Sun Calls. Also, get a FREE Samsung Galaxy SIII CASE with every subscription! More details after the jump. See the complete list of Sun postpaid application requirements by visiting here.